​ Closed-cell polyurethane spray foam is among the most efficient insulating materials commercially available, with R-values commonly around 6.0 per inch. Closed-cell polyurethane foam insulation incorporates an insulating gas that is retained within the cells (foam "blowing agent"), which leads to the highly efficient insulating properties of the material. In the U.S., insulation is measured in "R-Value" (R= resistance to heat flow), and closed-cell polyurethane spray foam has among the highest R-Values of any commercially available insulation. In addition, the closed-cell polyurethane spray foam insulation provides for a highly effective air barrier, low moisture vapor permeability (often referred to as the "Perm" rating), and excellent resistance to water. The most common foam density for closed-cell polyurethane foam is approximately 2.0 pounds per cubic foot. Years of research and commercial experience has shown that the 1.75 – 2.25 lb/ft³ density range provides the optimum insulating and strength characteristics for most building applications. Closed-cell polyurethane foams are usually characterized by their rigidity and strength, in addition to the high R-Value. Also, studies show that wall racking strength can by doubled or tripled when closed cell foam is applied. Open-cell Spray Foam, on the other hand, is usually found in densities ranging from 0.4 to 1.2 lbs/ft³. One of the advantages that these lower densities provide is a more economical yield, since foam density is directly related to yield (lower density = higher yield). Although the R-value of open-cell foams is slightly more than half that of closed-cell foams, usually around 3.5 per inch, these products can still provide excellent thermal insulating and air barrier properties. Open-cell spray foam is more permeable to moisture vapor, with perm ratings of approximately 16 per 3 inches thickness (up to 30-35 perms at one inch). However, the open-cell spray insulation foam allows for a very controlled diffusion of moisture vapor whose consistency can be managed by the builder / architect. Open Cell foam should not be used in exterior applications, or applications where it can be in direct contact with water. 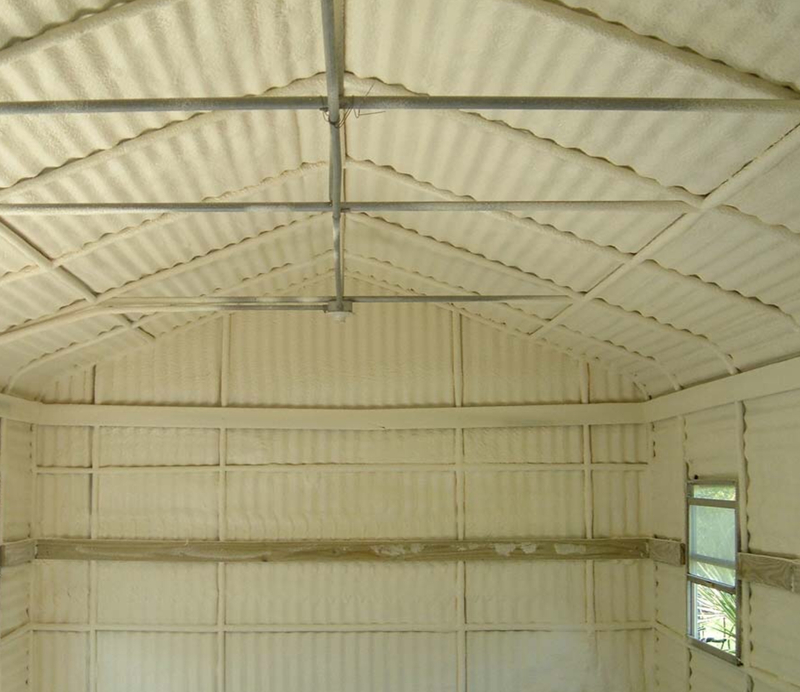 Open-cell foam insulation is incredibly effective as a noise insulation foam, having about twice the sound resistance in normal frequency ranges as closed-cell foam. However, they are not recommended for "flash & batt" applications. Other characteristics of open-cell polyurethane foam usually include a softer, "spongier" appearance, as well as lower strength and rigidity than closed-cell foams. 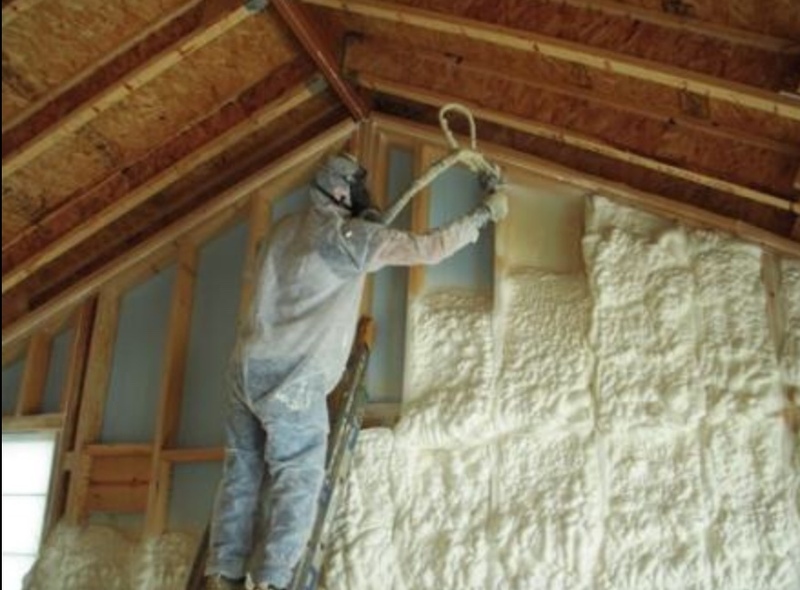 Applications that typically use open-cell spray foam include residential construction insulation, under roof trusses for "conditioned attics", and as a spray foam sound insulation in media rooms, etc. Closed-cell foam, while also useful in residential construction insulation, is used in a variety of commercial, industrial and residential applications because of the excellent strength and insulating properties described here.